GeoDepth® was introduced by Paradigm in 1992, as the world’s first commercial integrated velocity modeling and depth imaging system. To support its ambitious ongoing mission, many new velocity functions have been built and incorporated into the system over the years. What is not universally understood is that many of these tools have now found their way into the Paradigm software suite on both the Windows and Linux operating systems, and they are accessible for use by E&P generalists as well as depth imaging specialists. Since velocity and domain conversion are perennially challenging topics for all geoscientists, the following blog provides a high-level yet comprehensive description of interconnected velocity tools and workflows, as well as guidance as to when users should consider escalating from faster and simpler to more accurate and complex workflows and algorithms. If you were to open the Paradigm software online documentation, and diligently search for information on every bit of functionality that relates to velocity, you might come away overwhelmed by the quantity and richness of what is available compared to other commercial E&P software suites. The challenge, therefore, is making sense of all of this rich functionality; how to organize it, understand it at a high level, and then drill down to find the exact GUI and buttons that will make your life as an E&P professional easier and more successful. Fortunately, this is possible. Here's a “tree” with two branches and several leaves. This is the collection of Paradigm velocity functionality. The brown “seed” at the base is GeoDepth, the velocity model building and depth imaging package that helped lead the depth imaging revolution back in 1992. 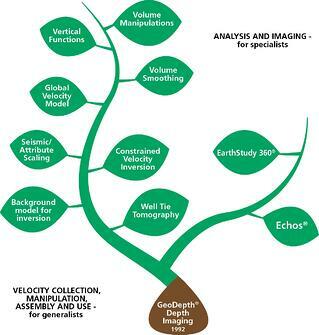 All of the individual pieces of velocity functionality began as part of GeoDepth, and are offered in the commercial GeoDepth package to this day. There is a way to divide this tree into two branches, which immediately makes understanding the software easier. One branch I call the “Analysis and Imaging” branch. The other I call the “Velocity Collection, Manipulation, Assembly and Use” branch. “Analysis and Imaging” was the original GeoDepth mission. This branch contains the collection of tools needed when the seismic image or seismic depth conversion is adversely affected by velocity complexities due to rapid lateral velocity changes (salt, fault shadow, permafrost, etc.) and vertical anisotropy (VTI/TTI). The EarthStudy 360® leaf has developed to handle the case of horizontal anisotropy due to layering, fracture sets, or stress. GeoDepth and EarthStudy 360 are always going to involve velocity analysis on prestack seismic gathers, seismic depth migration, and iterations of tomography. Echos® is the seismic processing platform which contains seismic depth migration codes, such as Reverse Time Migration, that run on Linux clusters. These are specialist products, and you, the E&P generalist, do not have to be concerned about how to use them. All of the tools along this branch are relatively easy to use, in that they do not require prestack seismic gathers, access to a Linux cluster, or picking velocity analysis semblance panels. Below is a high-level description of what each of the eight leaves does, and how it can be used to create useful products for your E&P project. We will start with the simplest and work our way up to the more sophisticated functionality. In order to break the blog into easy-to-read parts, we will discuss one module, Vertical Functions, in this article, and cover the seven other functions in a future installment of this blog. Vertical functions are velocity-related functions of time or depth, which are defined at specific points in X-Y space. They are 1-dimensional in time or depth, and they are called vertical functions because you can graphically represent them with a vertical chart, like a well log. WHEN TO USE: Vertical functions are part of the software which enable you to collect and manipulate velocity information, creating intermediate results. For example, it doesn’t create a final model for use in depth conversion, but it can be used to take 1D information and transform it into something that can be used to make a final model. Q: What can be represented by Vertical Functions? In the Vertical Functions display, everything can be displayed in either time or depth; you just hit the “Scale” button. Q: How do you create Vertical Functions? From velocity or slowness well logs; load these into the display. To save as vertical functions, choose File > Save. By regularly resampling a seismic cube with velocity values in the samples. From checkshots, but first: In the Well Log Window, run a Transformation: Time to Sonic Velocity, which makes a velocity log. Q: So you can make Vertical Functions from Velocity Cubes; can you go in the opposite direction? Yes, you can take Vertical Functions and assemble them into a velocity cube. Q: What are some other potentially useful tools in the Vertical Functions Window? V0-K calculation using a least squares algorithm, that gives the minimum sum of depth residuals between the real time-depth curve (from checkshot calibrated velocity logs) and the calculated time-depth curve, according to a linear velocity model in all wells or in each well separately. In this blog installment, we discussed the Paradigm velocity function “tree”, and how it developed from GeoDepth. We described the major branches: The “Analysis and Imaging” branch for specialists, contrasted with the “Velocity Collection, Manipulation, Assembly and Use” branch for E&P generalists. Finally, we focused on one of the “leaves” on the generalist branch - Vertical Functions. In a future installment of the Velocity Blog, we will describe the other seven velocity functions that sit on the generalist branch.